We all envy the Nordics for their great healthcare and education systems. Now we have one more reason to be jealous of them: the way they decorate their homes. Luckily, nobody prevents you from copying the Scandinavian style, so here’s what you have to keep in mind. Lighting is an important part of Scandinavian interior design. Considering they have as little as 7 hours of daylight during the winter, it’s no surprise they want to make the best of it. Big windows are quite often seen but more attention is paid to lighting fixtures. They usually tend to choose modern looking pieces ranging from pendants to wall sconces. Many Scandinavian rooms have candelabras above dining tables and candles spread around the house to give a warm feeling to an otherwise cold design with neutral colors. When it comes to furniture, clean lines are the way to go. 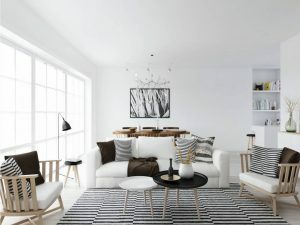 Smooth rounded edges and natural hues are some of the mid century modern tendencies accepted by the Scandinavian style. They place a lot of emphasis on practical storage options that mix well with the rest of the room and draw visual interest. Any Scandinavian style room has few design elements and absolutely no clutter. The neutral colors they use add to this impression of cleanliness. Full floor carpets are not very popular in the Nord. In fact, they like showing a big part of their floors. The Nordics traditionally install hardwood floors left in its natural color or painted white to make the room look bigger and brighter. Considering their winters are quite harsh, many bathrooms have heated tiles so that you can step barefoot on a warm surface. In typical Nordic homes, the walls are kept white. The idea is to move the attention toward the furniture and artwork instead of focusing on the color of the walls. Most designs display a fairly narrow color palette: black, white, grays and browns are the norm. They come in many different shades, but nothing that stands out a lot. Designers are trying to introduce some pop colors like rich sea greens to make the room more personal. Rugs and textures are generally made of smooth textiles, such as sheep skins, soft cotton and wool. This doesn’t come to a surprise coming from a cold climate country. It’s only natural to seek a feeling of warmth and coziness in your own home.